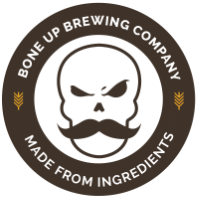 Stats: Summoner - Bone Up Brewing Co. Cheese Pairing: Kraft presliced American (but not the individually wrapped ones, have some dignity). Food Pairing: A hamburger topped with a fried egg and a steak (add potato sticks to taste). Best Occasion to Drink: While tailgating. Brewers' Notes: While goin' through the ol' hop freezer, we were struck by a hankerin' for the biscuity, citrus-forward pale ales that we grew up*** on, so we made one (and we threw in a lil' dash o' lupulin powder just to spice things up a bit)! It's a nice 'n' easy drinker that may just conjure up a memory or two of questionable decisions past (just like the good ol' days! ).